Hoping to throw the perfect first birthday party for your little one? The Blue One is Fun Birthday Party Kit for 32 Guests will help you do just that. With 32 lunch plates, 32 dessert plates, 32 lunch napkins, 32 beverage napkins, and 32 paper cups, this kit has all the items needed for the special day. This set also comes with 210 pieces of blue plastic cutlery (70 forks, 70 spoons, and 70 knives) so guests can enjoy all their favorite foods and snacks. 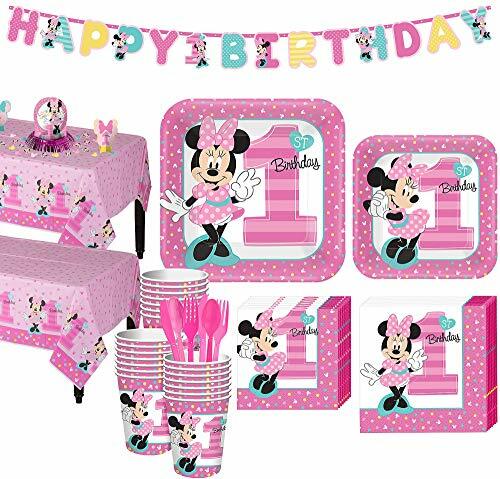 Complete the little one's birthday party theme with the 2 table covers, "Happy Birthday" banner, and the honeycomb table centerpiece. The centerpiece is round and made from blue cardstock. It features a lion and a monkey. The lion is holding balloons, and one of the balloons has a number "1" on it. The jungle birthday centerpiece also includes a tissue paper honeycomb base. Hoping to throw the perfect first birthday party for your little one? The Ultimate Little Lumberjack 1st Birthday Party Kit for 32 Guests will help you do just that. Hang the pennant banner, the banner kit accessories, and the paper fan and swirl decorations to set the outdoor mood. Hand out the photo props and display the posters, so guests can capture the memories of all the fun. With 32 lunch plates, 32 dessert plates, 32 lunch napkins, 32 beverage napkins, and 80 paper cups, this kit has all the items needed for the special day. This set also comes with 210 pieces of pink plastic cutlery (70 forks, 70 spoons, and 70 knives) so guests can enjoy all their favorite foods and snacks. Add the table centerpieces and party cutouts for the final touch. Hoping to throw the perfect first birthday party for your little one? 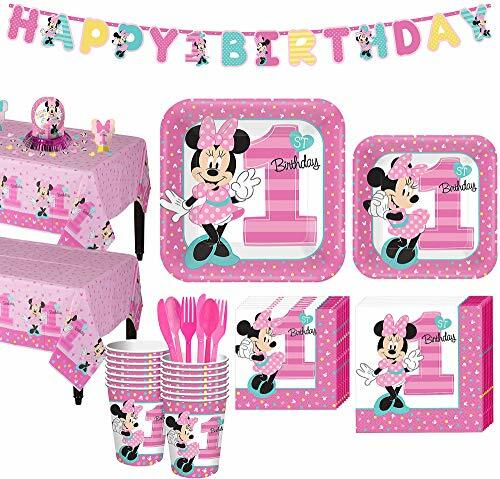 The 1st Birthday Mickey Mouse Party Kit for 16 Guests will help you do just that. With 16 lunch plates, 16 dessert plates, 16 lunch napkins, 16 beverage napkins, and 16 paper cups, this kit has all the items needed for the special day. This set also comes with 2 sets of red plastic cutlery (16 forks, 16 spoons, and 16 knives) so guests can enjoy all their favorite foods and snacks. Complete the little boy's birthday party theme with the 2 table covers, 2 banners, and 23 piece table decorating kit. 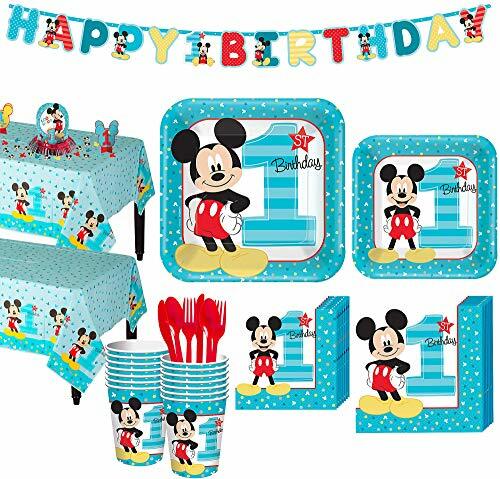 The kit includes a large centerpiece with Mickey Mouse with a "Look Who's 1" headline surrounded by blue number "1"s and metallic red trim at the bottom. This cute decoration kit comes with one plastic bib, one plastic floor mat, one mini plastic banner and one paper birthday hat that will make getting your party started as easy as can be. Just lay the birthday mat directly under your child's high chair so it can catch anything that falls and help you keep your floor clean. Next, adjust the mini birthday banner so it wraps around the high chair legs. After that, get your baby ready for her party by punching out the bib from its plastic backing and securing it around her neck with its easy-to-use adhesive strip. You'll be pleased to find the bib even features a small pocket for catching crumbs. Lastly, put the birthday hat on your baby's head by gently tying the kid-friendly ribbons under her chin. 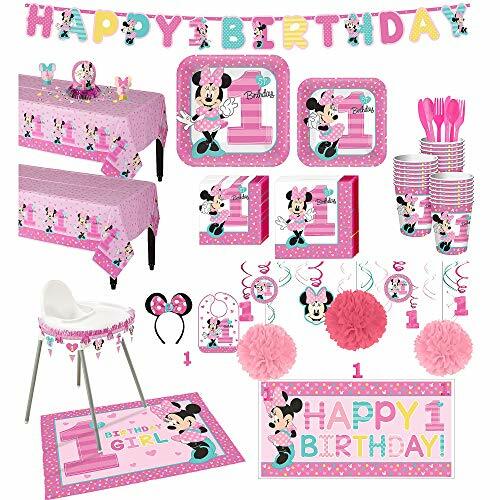 Decorating your girl's first birthday couldn't be easier when you shop our other Pink and Gold First Birthday party supplies. 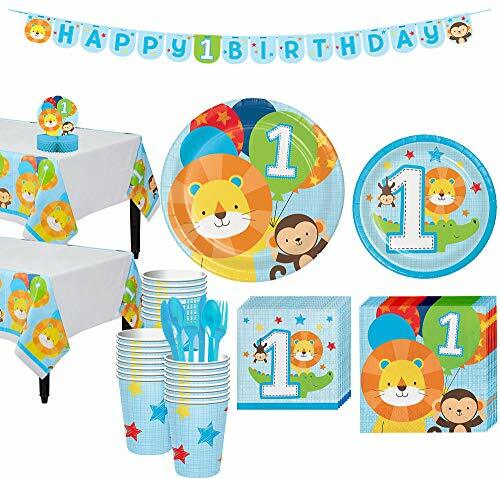 Let Daniel Tiger host your child's next birthday celebration in his Neighborhood with these officially licensed Daniel Tiger party supplies! 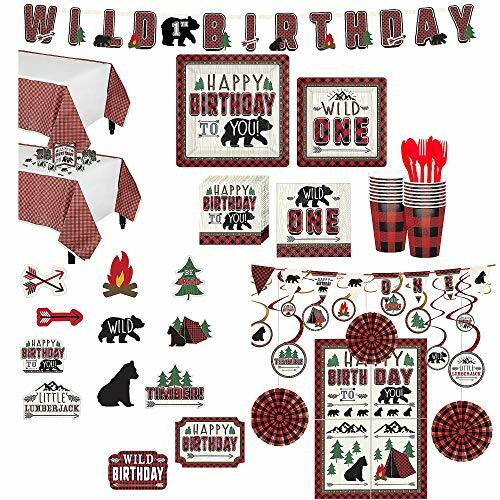 This Party Pack for 24 includes two plastic tablecovers, 40 lunch napkins and 24 each of dinner plates, dessert plates, nine-ounce cups, forks and spoons. This product is made of paper and plastic. Each One is Fun Boy 1st Birthday Party Supplies Kit contains: 8 One is Fun Boy Paper Plates, 8 One is Fun Boy Dessert Plates, 16 One is Fun Boy Napkins, 16 One is Fun Boy Beverage Napkins,1 One is Fun Boy Plastic Tablecloth, 8 One is Fun Boy Cups, and 24 Fresh Lime Green Assorted Plastic Cutlery. 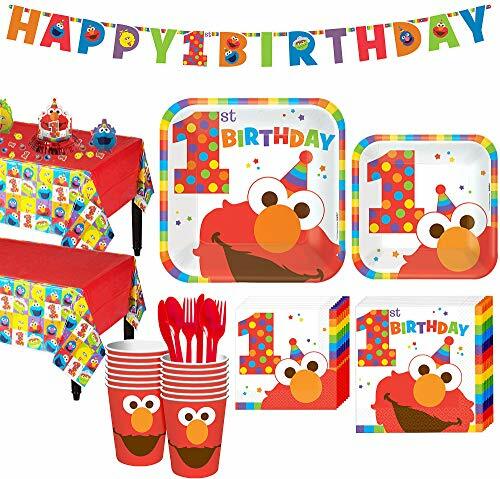 Perfect for your son's first birthday, these party items will make your celebration a big hit. Complete with all the utensils you need, this kit is quintessential when planning for the 1st Birthday milestone! Super soft light-weight relaxed fit raglan, made with a cotton/poly fabric blend. Our "Gonna Party" 1st Birthday Raglan features our adorable gonna party design with a festive #1 and a party hat! This shirt is perfect for any birthday party theme and looks great in pictures. Our raglan is light enough to be enjoyed during the warm summer months and can be layered over a tank during cooler months. Make preparations for your little one's first birthday party quick and convenient with our charming Turtle First Birthday Party Pack for eight party guests. This pack of party tableware includes: eight cake plates that each measure seven inches, eight napkins, eight paper cups and one plastic table cover. The matching pattern in this Turtle Party Kit features an adorable turtle on a striped, check and polka dot background with "Happy 1st Birthday" text. For a celebration sure to draw all tiny tots out of their shells, pair this tableware with other Turtle First Birthday party supplies and party decorations.